Popcorn Candy Crackle… with 3 ingredients! I don’t know many people who don’t fancy popcorn or the smell that overwhelms the house when it’s popping in all it’s glory. Popcorn is a low-fat snack that is also low in calories when air-popped without all the creamy butter and a great way to satisfy when the crunch monster appears. Let’s face it though, plain popcorn is boring. For most of us our first memories of popcorn stems from the movie theatre or while watching a movie at home. Many of you might even remember Jiffy Pop. It’s almost a must-have for movie fans to buy a bag of movie theatre popcorn even though we know how expensive it can be. If you don’t go to the movies and opt to watch movies at home making popcorn is a cheap snack that won’t break the bank. My kids are huge fans of popcorn especially buttered microwave popcorn. If you don’t like the convenience of putting popcorn bags in the microwave you can still do it the old-fashioned way in a pot or the safer Jiffy pop way. I think for most households the popcorn bag is the easiest way to go for home popcorn because it’s the fastest especially if parents aren’t around to help. Most microwaves have a dedicated ‘popcorn’ button and if you know what “This side up” means than you are good to go. Buying popcorn kernels are just as popular today as they were back when our parents were kids. I can’t say what the best popcorn kernels are but I’m sure you get what you pay for depending on the quality of the corn that is used. Sometimes trial and error is your best bet. Either way you end up with a lovely fluffy kernel that has exploded in which you can add just about any flavours. Growing up Mr.CBB says he was a big fan of caramel popcorn which is dead easy to make as long as you know how to make caramel. Some of you might have enjoyed caramel popcorn balls growing up which is simply caramel and popcorn rolled into a tennis ball. Today though I’m going to share with you the fastest popcorn snack for the holidays. Admit it that when you walk through the mall and you smell Kernels popcorn you instantly reach for your wallet. Come on, you know you’ve done it or you hope they have a little dish of popcorn samples for you to taste. The best part is that some of those popcorn flavours you can replicate at home or even create your own for a fraction of the cost. You might not be able to replicate the Kernels special standard butter popcorn flavour because they have huge popping vats and recipes but it’s simple to jazz up popcorn without paying the high costs of the popular mall popcorn especially if it’s not in your budget. That’s probably why Kernels flavours are available at the grocery store so you can experience the Kernels taste at home but for less. Even better is creating your own popcorn seasonings from spices in your pantry. Ah.. Now there’s some smart thinking! Popcorn has such a pungent and inviting aroma and once you pair it with seasonings whether sweet or savoury it turns the popcorn from bland and boring into mouth-watering treats that are hard to resist. If you are anything like me you want quick ideas for those last-minute Christmas and New Years parties that won’t break the budget. Although I like to stock my pantry with semi-sweet chocolate chips once in a while I head to the local bulk store to get white chocolate wafers which are great for melting. 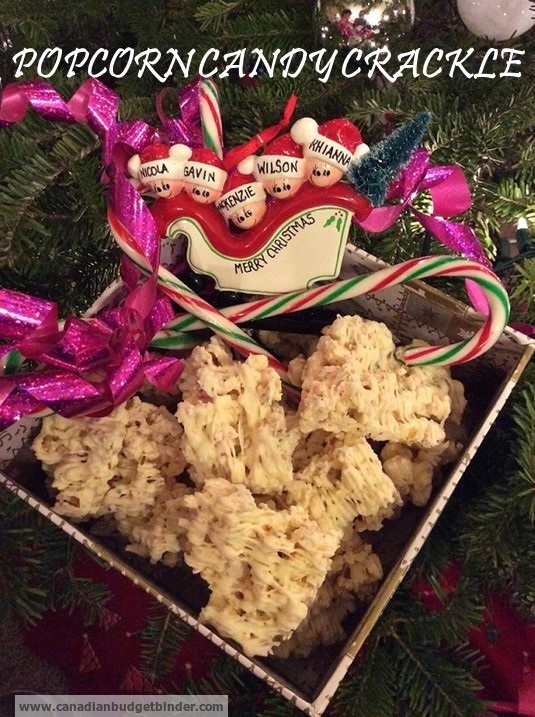 This recipe has 3 ingredients, white chocolate wafers, candy-canes and popcorn. That’s it!! Well here is that quick recipe that friends and family will want year after year because it’s so addictive. Trust me I am not a big fan of candy canes but oh my this popcorn is to die for especially for those with a sweet tooth. Cook time: Time to pop the popcorn and melt chocolate in microwave oven is included in prep time. Set in the refrigerator to harden for 15 minutes or if you can wait that long, the next day! If you like popcorn and you enjoy sweets you get the best of both worlds with this holiday Popcorn Candy Crackle great for family or to give away to guests for a gift. Pop popcorn in microwave as per instructions on the packet. Whilst that's in the microwave place candy canes into a blender and blend until it resembles a fine powder. Don't worry if there is some lumps. Melt 1 cup of chocolate in the microwave in small bursts. I usually place 1 cup at a time for 1 min at a time until it starts melting as it depends on the wattage of your microwave. Now pour the first cup of chocolate over the popcorn and mix well. Next shake the candy cane into the bowl and mix really well again. Now empty onto a baking sheet lined with parchment paper and press down til top is smooth. Melt the other cup of chocolate as per the above step. Place into a piping bag or as I do a sandwich or small freezer bag. Snip off the end and drizzle over the popcorn until all the chocolate is used. Place in the fridge until hard then cut into squares. There you have it an easy instant party candy to take to any party that will wow your friends and have them asking for more. Candy canes go on sale at the end of the Christmas season at reduced prices too so you can make this all year if you stock up. I picked mine up for $0.50 for a pack of 12. Just think of how much of this popcorn crackle you can make! Follow Me on Social Media PLUS… Subscribe to the blog so you get my daily email. 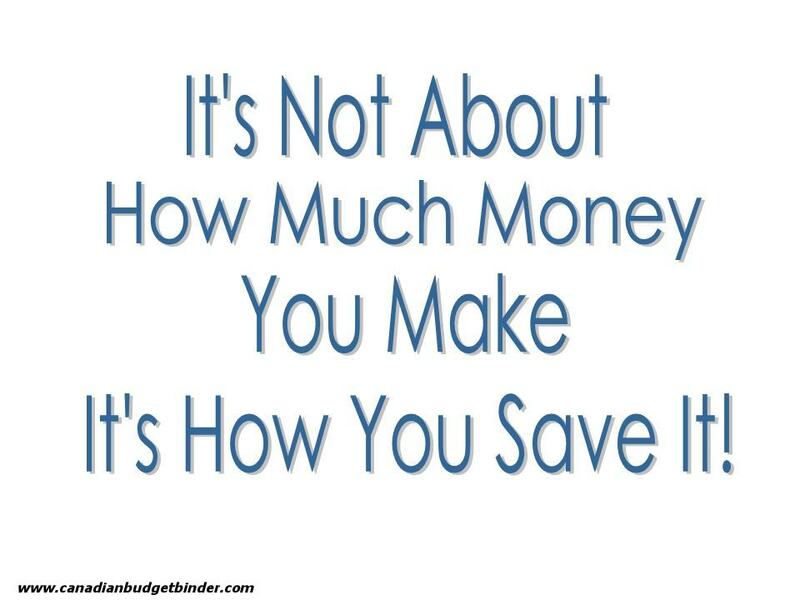 Get our FREE Excel Budget Spreadsheet that WE use and Free Money Saving Tools! Check out my Ultimate Grocery Shopping Guide and start saving money in your grocery budget. I can try it but since I don’t like Candy Canes, I’d leave those out. Because of the cost, I’d be making it with hot-air popcorn and not the microwaved popcorn. I do like both kinds though. Your welcome Jayson. I will tell you now you better make a big batch as you will be craving for more lol! Enjoy your movie too! Nicola, I just bought the ingredients for Popcorn Candy Cane Crackle. Later, we will have it while I and my wife are watching the movie, The Other Woman. It is something new, so I thought I’d try it out. Thanks Nicola. Christine it would be gone with just normal popped corn too! I can see my SIL loving this!!! She loves her candy canes!!!! I will have to figure out how to do this with regular air popped popcorn as I don’t buy the microwave stuff….don’t know what it is but I can’t stand the smell of it….. I have some white chocolate chips in the fridge…..might try it with those….. Thanks Nicola!! !